The district is well connected with the state capital and surrounding district headquarters through road and rail linkages. The road network consists of Express Highways, National Highways, State Highways and Major District Roads. The rail network consists of both broad gauge (Electrified and Non Electrified) double track as well as single track lines. The district headquarter has connectivity through airways for transport and trade to major airports within the country and to select international destinations. In spite of availability of perennial river stretches, there is no significant utilization of waterways in the district. The district has total length of 13,642 km of roads(2001) of which 5394 km roads are Bituminous surface, 3554 km roads of waterbound macadam surface and 4694 km of other surface roads i.e. unmetalled road.The roads are classified according to their importance. Of the total road length in the district, 331km road length is covered by National Highways and 1368 km by State Highways. The major and other district roads have a total length of 5388 km, which passes through all the talukas. Almost all the villagesare well connected by waterbound macadam road. The total length of village roads is 6555 km. National Highway No. 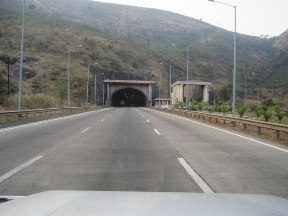 4 (Mumbai-Banglore) – The NH-4 passes through following places in the district: Khandala, Lonavala, talegaon, Chinchwad, Pune and Khed-Shivapur. 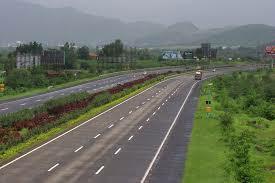 It enters from Raigad district and exits in Satara district.Total length of NH4 in the district is 120 km. National Highway No. 9 (Pune-Solapur-Hyderabad )- The NH-9 starts at Pune district and passes through Loni, Bhigawan and Indapur. It exits in Solapur district. Total length of NH9 in the district is 152km. National Highway No. 50 (Pune-Nashik) – The NH-50 originates at Pune and passes through Chakan, Rajgurunagar, Manchar, Narayangaon, Aalephata and it exits in Nashik district. The total length of NH50 in the district is 95km. The braod gauge single and double track rail length within the district have a total length of 311 km. Of these, single line is 162 km and the double line is 149 km. 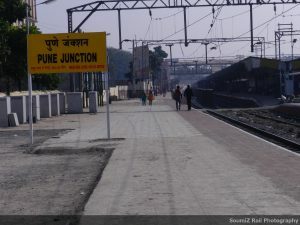 Pune and Daund are the two railway junctions in the district. Following are the three main railway routes passing through the district: Mumbai_pune_Solapur rail route Pune-Miraj rail route Daund-Baramti rail route. 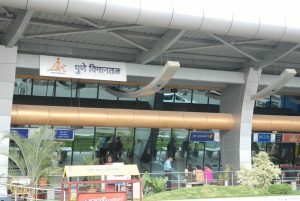 Pune is well connected through domestic airlines with the entire country. The airport located at Lohgaon has recently aquired status of an international airport and is being used to carry domestic as well as international traffic. Also, it is proposed to develop an international air-cargo hub near Khed tahsil of district.